A trip to Bhilwara Rajasthan. Singapore – Mumbai by air. Mumbai to Udaipur by air. Udaipur to Bhilwara by road. Cabs to the airport, airport waits, security checks, luggage hassles – lots of tedious little things such as these to deter me from making such journeys frequently. But focusing on the goal keeps my head free of fatigue. In this case the goal is to execute the final stage of a large artwork project for a prestigious Singapore client. The folk artwork is gorgeous and my personal reward comes from being instrumental in creating awareness about rural folk arts in an international audience. Will write more about the artwork in 2 weeks. The road journey from Udaipur to Bhilwara, as are all road journeys through rural India, is simply fantastic. I love the lack of infrastructure, the sights of people going about their lives in simple and very attractive ways. Stopping at a dhaba for hot chaay and fresh mathri, passing camel carts and women herders all add to the unforgetable flavor of the road trip. 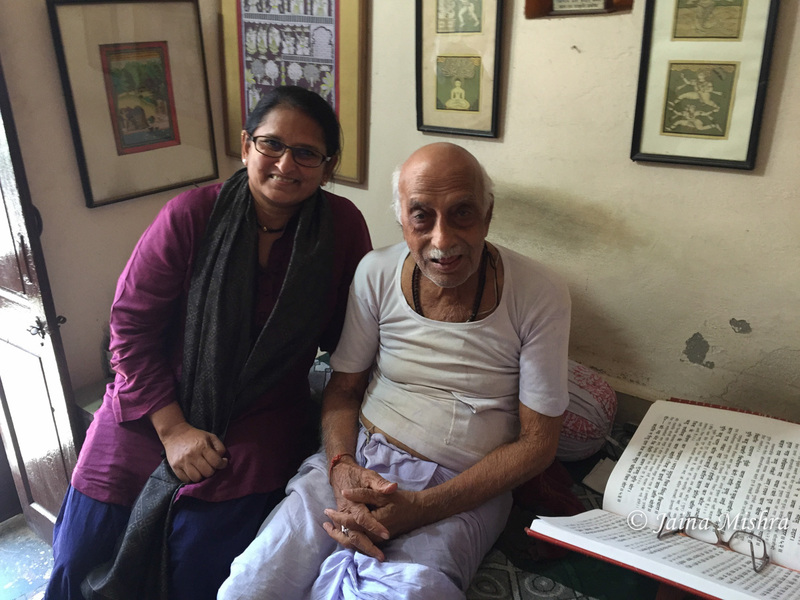 And then we reach the home of my host in Bhilwara – the artist. When one considers the mind-boggling diversity of the art of India, and the numbers of highly skilled and highly acclaimed traditional artists, the significance of this award sinks in. It is the highest art award in the country and is awarded to a dozen or so people selected out of a few thousand equally capable artisans. I do not envy the people that are in charge of making that selection! I prepare myself to meet a man of extraordinary achievements in the field of art – probably the most decorated man I will ever meet as there is no award higher than this one in the field of Indian Art. In one half of my life, achievements – howsoever small – are celebrated and worn on the sleeve at all times so that no one – neither the person who has earned it nor the rest of the world – forgets their greatness. It is a crown that is always worn in the form of an elitist attitude – a crown that all are expected to bow to. But in this other half of my world, I see a different attitude. All along the road trip with the artist – the son of the Padma Shr awardee, not once does he boast about his father’s award or his own President’s Award. We talk about the art and the culture and the rural folk stories surrounding the art. When we reach his home, I am introduced to the very honorable father and his beautiful mother. As I touch both their feet out of respect for their age as is the custom, they both come across as just ordinary folk living their gorgeous Rajasthani culture. 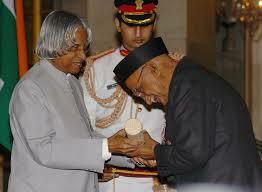 Had I not known about his achievement, nothing in his demeanor would have given me a clue of his greatness. Simple, humble, down to earth are the only words that describe him. And I was expecting someone who would flaunt his awards and have at least a streak of arrogance!! What a different world this is. So endearing these values are! 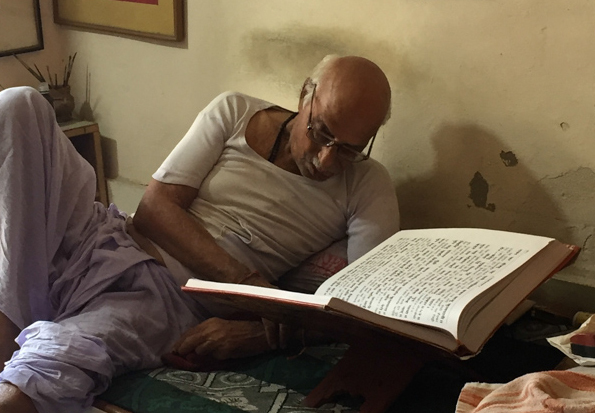 I meet him every day over the week and find him reading his Ramayana in large print to pass time. He comes along to look at the artwork and enjoys watching over the preparation. He is humble, simple and lives a frugal non-flashy traditional life. I come away thinking about the meetings and conversations with him. For him, the award is just something incidental that happened to him. It did not become the anchor of his identity – it was just one of the events in his life. He is still engrossed in the art and not in his own achievement in the field. The recognition conferred upon him by the government of India, prestigious as it is, and well-deserved as it is, is peripheral to his self-defined identity as an artist. And therein lies his greatness. He worked ‘swantuh sukhaaye’ for ‘for his own fulfilment and not for the glory and medlas that others conferred upon him! And for that reason, I am honored to have met him. This entry was posted on October 30, 2015 by wovensouls in People Kaleidoscope and tagged artist, award, awarded artist, bhilwara, folk art, Indian art, Indian folk art, padma shri, people, Rajasthan, rajasthan art, shreelal joshi, traditional art, traditional artist.